The NRCN commissioned this report to look at the funding needs of rural forces in the light of rural demands. Its purpose is to build an evidence base to ensure that the needs of rural communities are appropriately and fairly met by any newly proposed funding formula or arrangement. In recent years, as Police and Crime Commissioners (PCCs) have listened to their rural constituents, awareness of the impact of rural crime has increased. It is slowly being recognised that rural areas, with isolated, sparsely populated areas and limited access to support services, need an appropriate policing approach. The National Rural Crime Network (NRCN) was formed to address these concerns. It consists of 30 PCCs plus rural stakeholders who recognise, and are working to improve, the response to this demand. In an environment of smaller budgets and shifting response models, it is vital that Government provide fair funding for forces with rural demands, some of which have only recently been identified. A survey conducted by the NRCN in 2015 shows that the demands and impact of rural crime on a dispersed population put it on a par with the challenges of tackling crime amongst dense urban populations. 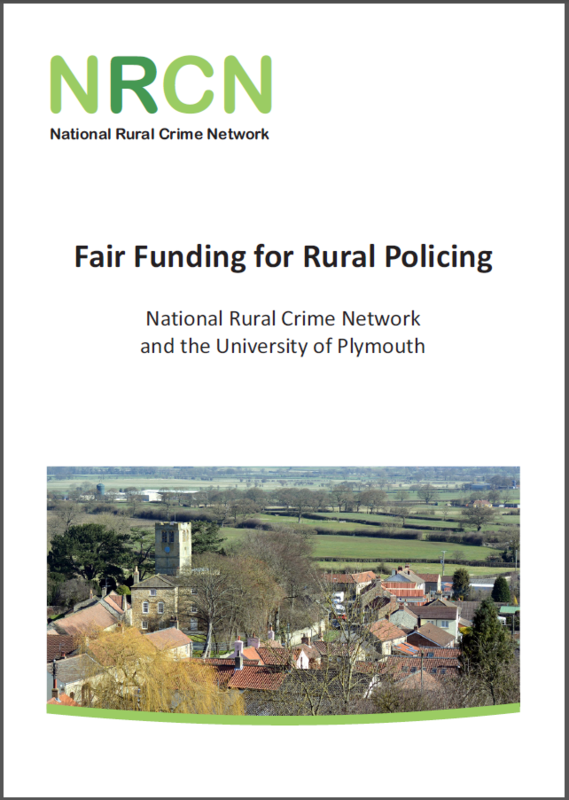 On average, rural communities foot a crime bill of up to £800 million every year, and have only half the confidence in the police’s ability to respond to their needs compared to the nation as a whole. That only a quarter of people surveyed for the Crime Survey for England and Wales are from rural areas, gives an indication as to why rural concerns may not have been well understood until recently. The central recommendation of the NRCN survey report was the need for a review of funding allocations to ensure fair funding for rural forces. 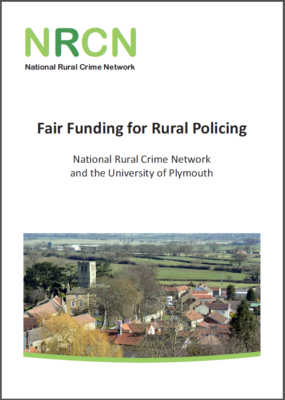 In July 2015 the Home Office presented a new police funding formula for consultation, but, to the dismay of NRCN members, this formula seemed likely to reduce funding for rural forces over and above losses seen by urban forces. The NRCN therefore commissioned this report to look at the funding needs of rural forces in the light of rural demands. Its purpose is to build an evidence base to ensure that the needs of rural communities are appropriately and fairly met by any newly proposed funding formula or arrangement. Whilst this report was being written the Home Office withdrew its proposal after serious concerns were raised during consultation. However, with the funding formula still under review, the NRCN considers the findings of this report as important considerations for any future proposal. The proposed funding formula evaluated its approach using count-based correlation coefficients based on reported crime, rather than correlations based on crime rates per head of population. This heavily skewed their findings dependent on population size and density, and by higher volume crimes predominant in urban areas. This also negates the far greater amount of police time spent on non-crimes. This report therefore sets out to demonstrate why and how this analysis needs to be revised in future to better reflect complex crime patterns across all areas of the country. The report also looks to raise awareness of the additional costs associated with rural policing which occur in sparsely populated areas. Pressures from gaps in the delivery of other services and seasonal movement from urban areas are more significant for rural forces, for example. A fair funding formula must account for these aspects. Importantly this is not to say that urban forces do not have their share of problems; nor that rural forces should be treated as special cases. Simply, complex and varied demands on police officers and budgets in different areas and contexts must be taken into account to ensure fair funding. Analysis which relies on reported crime statistics is heavily biased by volume crimes. Theft, and therein shoplifting, dominates these statistics, but relates closely to urban deprivation, skewing funding towards urban areas. Theft also requires a low resource-intensive response compared to other crimes. The pattern of theft crimes does not reflect that of other crimes, such as Child Sexual Exploitation, their demands, drivers, distribution, or resourcing requirements, and therefore will not capture variations in costs between urban and rural forces. Moreover, count-based correlation coefficients used by the Home Office, which respond to variations in population size, do not capture or predict demands from non-crimes when based on reported crime statistics. Non-crimes, such as road traffic incidents (RTIs), anti-social behaviour (ASB), public safety and welfare (such as missing from home cases) and mental health incidents, require different and often resource-intensive responses. Rural forces have much higher rates of RTIs than urban forces. Urban areas see a concentration of mental health issues, especially amongst the young, but have larger support service resources. Rural areas see a prevalence of mental health issues amongst the old, but the police often have to take on support service responsibilities out of hours or in isolated locations. In consequence of these findings, the proposed funding formula inadequately maps demand, and is likely to increase the disparity in funding. Forces which currently receive less than average per capita allocations will see those allocations fall further, whilst forces with higher than average per capita allocations will see them rise. Whilst the current proposal has been dropped, a comprehensive review of the statistical mapping and analysis methodology is required before any future formula also fails to readdress such discrepancy. Fixed, non-staff costs are higher amongst rural forces which cannot benefit from economies of scale due to the need to serve more dispersed, low density populations. For example, this equates to £32.1 million across the 10 smallest forces (by population), the equivalent of over 600 officers. Given that rural forces generally have smaller workforces than urban forces, this has implications for service delivery. Significantly higher round-trip distances are found in forces serving low-density populations, increasing costs. As rural forces have lower officer numbers, the burden per officer is also higher by up to 65 per cent. These two factors combined again represent implications for service delivery, as well as officer welfare. All forces experience seasonal variations, but the minimum-relative-to-maximum variation, especially for daily crime and ASB is far greater in rural forces, especially those with National Parks and coastal areas attracting holiday-makers. The seasonality of demand must be recognised not only to ensure geographic equity, but also that minimum levels of service can be maintained throughout the year. As mentioned above, rural forces see a greater responsibility for other services, often having to deal with service provision out of hours or in isolated areas. This is intensified by lower levels of third sector support outside cities. Mental health responsibilities are particularly noticeable, particularly with regard to dementia and missing person cases due to elderly populations. These additional costs, being largely non-crime related, fail to be accounted for by the proposed funding formula, significantly disadvantaging rural forces.